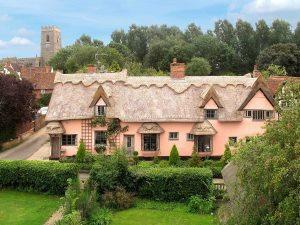 The Old Drift House01582 763533work Self-cateringThis lovely 15th century cottage is steeped in character with exposed beams in every room, inglenook fireplaces, lead-light windows, bread oven and old brick floors. The cottage garden is typically English, warm, secluded and quiet. There are 4 large bedrooms (2 double, 2 twin connected if required) with linen and towels provided, three bathrooms, sitting room with baby grand piano, dining room, fully fitted kitchen/breakfast room, laundry room, central heating, dishwasher, freezer, washing machine and dryer. Telephone, cot and highchair are available by arrangement. There is ample garden furniture, bbq and two terraces for informal summer dining. Entertainment includes stereo, TV, Freeview, DVD, iPod player/charger and Wi-Fi. There is a garage for car or bikes. Kersey is in Constable and Gainsborough country. This lovely 15th century cottage is steeped in character with exposed beams in every room, inglenook fireplaces, lead-light windows, bread oven and old brick floors. The cottage garden is typically English, warm, secluded and quiet. Colchester A12/B1070 to Hadleigh. Bury St Edmunds A134/A1071 to Hadleigh. From Hadleigh A1141 signposted Lavenham for 1 mile. Turn left to Kersey, right at the Church, down the hill for 100 yards, first turn left, first house on left. Not easy by public transport. Train to Colchester, Ipswich then a 40 minute taxi from there.